Beautiful old finca, renovated and comfortably furnished. The house is located on a plot of 70,000 m2 including 2,000 m2 fenced. Nice view of the east coast, the sea and Formentera. Room, Ground level. This bedroom has 1 double bed 160 cm. Bathroom ensuite, With bathtub. This bedroom includes also air conditioning. Room, 1st floor. This bedroom has 1 double bed 180 cm. Bathroom ensuite, With shower. This bedroom includes also air conditioning. Room, 1st floor. This bedroom has 1 double bed 180 cm. Bathroom outside the room, shared, With bathtub. This bedroom includes also air conditioning. Room, Ground level. This bedroom has 2 twin beds 90 cm. Bathroom ensuite, With shower. This bedroom includes also air conditioning. Large living room overlooking the covered porch, second living room with TV (satellite Astra), dining room and open kitchen, all these rooms are very spacious and bright. Deckchairs for 10 people and two umbrellas. Outdoor dining room with table for 14 people. Summer kitchen with: Masonry barbecue, fridge and sink. Airport: 13 kms and shops. 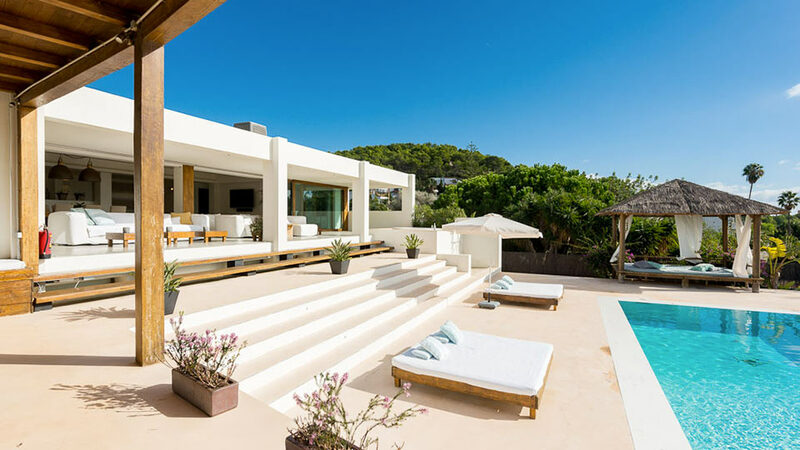 The airport is 35 minutes away by car and the villa of Ibiza is 20-25 minutes away.